Ready to take the exam? 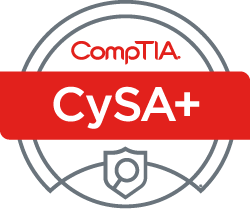 Buy our discount CompTIA CySA+ exam voucher, save money and get certified! CompTIA exams may only be taken at VUE testing centers. CySA+ certification exam vouchers $329.99! One CompTIA CySA+ certification exam voucher. There is one CySA+ exam, so you only need ONE voucher. You do not need the physical voucher to register for your exam (you only need the voucher number you receive via email). Vouchers may only be used at VUE testing centers.